Growing transmission and distribution network and rural electrification program coupled with infrastructure development are the key factors driving the switchgear market in India. Government schemes and initiatives such as UDAY and DDUGJY are expected to further fuel the growth of switchgear market in the forecast period. According to 6Wresearch, India switchgear market size is projected to reach $3.7 Billion by 2022. According to Niti Ayog, the government of India is planning to reach a renewable energy capacity of 175 GW by 2022. Further, government initiatives to increase the penetration of clean energy in the forecast period is also a major source of growth for the switchgear market in India. Low voltage switchgear dominated the overall India Switchgear market and also reflects the highest growth due to rapidly growing commercial and residential sectors. In medium voltage, AIS holds the major revenue share, however, gas insulated switchgear is expected to increase its market share in the forecast period. The Northern region accounted for the largest revenue share in the overall India switchgear market share during 2015-16 followed by the Western region. Uttar Pradesh, Tamil Nadu and Haryana states dominated the market with around 53.82% market share in terms of power sector investments in 2016. During 2016-22, the Northern and Southern region are anticipated to witness highest growth rate. 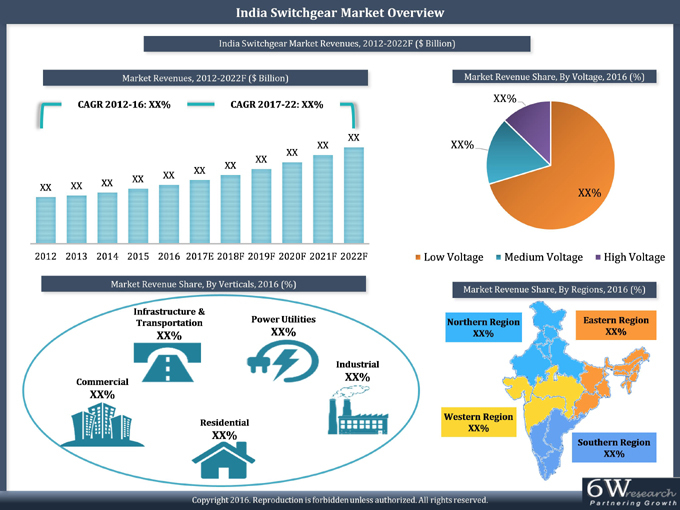 India switchgear market report thoroughly covers the India Switchgear market by voltage, verticals and regions. India switchgear market outlook report provides an unbiased and detailed analysis of the on-going India switchgear market trends, opportunities/high growth areas, market drivers which would help the stakeholders to device and align their market strategies according to the current and future market dynamics. 16.2	Anchor Electricals Pvt Ltd.
16.4	GE T&D India Ltd.
16.6	Larsen & Toubro Limited. 16.7	Legrand India Private Limited. 16.8	Schneider Electric Infrastructure Limited. 16.10	Toshiba Transmission & Distribution Systems (India) Private Limited.